In our wide range of products, we are exporting, retailing and supplyingBanana Fiber Bags. 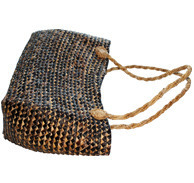 The offered products are manufactured from Banana Tree Bark processed into Knotted Fibres. These are extensively admired by our clients for their attractive looks, durability and reliable performance. Moreover, the offered products are available at market leading prices for the clients. Backed by our rich industry experience, we are involved in providing Banana Fibre Bag to our beloved clients. 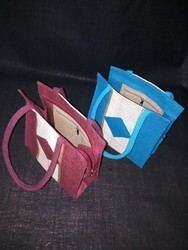 The offered range of the bags are created from the banana fibre. These bags have large number of space to keep several items such as vegetables, stationery items, fruits, etc. These are the basket made from pure banana fiber fabric in original color and with enough space to accommodate materials and it is known as basket bag of size: 12' W x 13'/14'/15' H x 3' Gusset and having top of 18' with shoulder strap in leather and external leather pocket. Internally line with fine fabric with needed pocket for chain and mobile. Best quality accessories. We are engaged in offering quality Banana Fiber Hanging Bags. Easy to carry, they come in different colors and shades. Each piece of our banana handicraft bags has a visual message in their patterns, styles and colors. These products have perfect finish and elegant look. Further, our products are customized design at affordable price. We are looking for foreign queries. - Ideal for cross fitness+ boot camp training back shoulder mainly. Ideal for cross fitness+ boot camp training back shoulder mainly. Eco-friendly bags are made from banana fibre or banana fibre paper can be substitute for polythene bags.